P2MS is a script pattern that allows you to lock bitcoins to multiple public keys, and require signatures for some (or all) of those public keys to unlock it. Although P2MS is a standard script, it is now more common to wrap this type of script in a P2SH (see below). Include an opcode M to indicate how many signatures are required. Include another opcode N to indicate how many public keys there are. Put the CHECKMULTISIG opcode at the end. CHECKMULTISIG Bug: This opcode actually has a bug where it pops one extra element of the stack than it needs to (off-by-one error). So to avoid an error, we add a dummy value (typically OP_O) at the start of the scriptSig. When this script executes, all of the signatures and public keys get pushed on to the stack. Pops off N, and then pops that number of public keys of the stack. Pops off M, and then pops that number of signatures of the stack. If the signature does not match the public key, we move on to the next public key and check that one. However, that public key will also be ignored for every subsequent signature (so make sure you put your signatures in order in the scriptSig!). If the signature matches the public key, we increment a tally and repeat for the next signature. 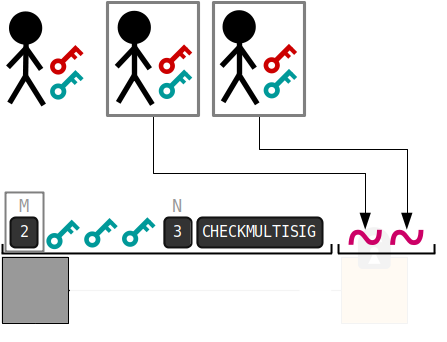 If the tally of valid signatures is equal to M after all of the signatures have been checked, then CHECKMULTISIG pushes a 1 on to the stack and the script is valid. Where can you find P2MS scripts? It's not common to find P2MS scripts in the blockchain, as most multisig transactions use the newer P2SH script instead. According to this cool blockchain explorer, only 1% of all locking scripts are P2MS, so they can be hard to find. You will not see any addresses for the P2MS locking scripts in the transactions above, as P2MS does not have its own address format (like P2PKH and P2SH do). Why do we now use P2SH instead of P2MS? P2MS has no address format. So if you want someone to put a P2MS lock on your bitcoins, you will need to construct and send them the raw locking script yourself. Worse still, they may not be able to create this transaction for you, as most wallets only allow you to use addresses (and not raw scripts) when making a transaction. P2MS is limited to 3 public keys.1 The locking script of a P2MS can get pretty sizeable with all the public keys, so it's limited to 3 (to prevent too much data being stored in in the UTXO set). However, with P2SH you can use multisig locks with up to 15 public keys. So you can still use P2MS if you want, but it's more convenient to use P2SH to achieve the same thing instead. P2SH is basically a script that allows you to wrap another script inside it (e.g. P2MS). So why do we have both P2MS and P2SH? Because P2MS became a standard script before P2SH was available. So P2MS remains as a relic from the time before P2SH existed.